A frank 'money talk' is an important step as couples set out to become teammates for life. NEW YORK ( TheStreet) -- Q: I recently asked my girlfriend of two years to marry me. My friends keep telling me that we need to have a real discussion about money before the big day. We are both financially responsible people, so I have never seen this as a problem. What do you think the best way to proceed is? A: Your friends are correct. Money problems and divorce frequently go hand in hand. As a result, couples need to discuss finances in terms of the past, present and future. 1. What is an individual's net worth entering the marriage? Past . . . This is what you bring to the table. This might not be the sexiest thing to talk about, but welcome to marriage! Not simply a matter of salary and savings, this includes investments as well as debts, retirement accounts and yes, credit scores! You may also need to look at potential monetary inheritance including real estate. New discoveries will be uncovered for better or worse. However, it's better to know now, in lieu of being surprised later. Marriage is as much a merger of personal assets as it is a declaration of one's desire to have and hold. Therefore matters of finance are important to unearth prior to stepping into your future life together. 2. How will each partner handle day-to-day money management? Present . . . This is how you'll play the cards you've been dealt. Obviously as a unit, you're going to have joint bills. 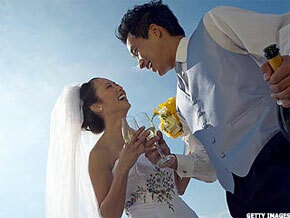 It is essential to make decisions regarding the financial aspects of your twosome prior to marriage. Logistically, you'll need to determine all aspects from how you approach your personal bank accounts to how bill payment might be allotted. Different couples have different approaches; some will simply merge all of their finances, while others will designate one joint checking to pay all bills and decide to keep their separate checking accounts active. There are endless possibilities and no one correct way to join financial forces. It all boils down to the people entering the union and how they best work together. The significance in choosing to have these discussions prior to marrying will create a very powerful adhesive in the partnership. As two unique individuals come together and share in a strong decision-making process they can both agree upon, the couple will inherently grow together and bond more fully. 3. How do you both see your financial future? Future . . . This is how you'll build and strengthen your house of cards. This is the biggie, my friends! Here is where we will really talk about the present joint goals you have for your marriage and your life. This discussion centers around the type of life you and your partner see together; goals involving children, retirement and lifestyle. Assuming you've probably had these macro conversations before you became engaged, now's the time to hold discussions which specifically quantify your joint desires. Please see two examples I have given and a few basic discussion questions to begin with. Example 1: You have both determined you want to buy a house. Example 2: You have both determined you want to have a kid in the next two years. How much will it cost to achieve the goal? Are either of you fiscally ready to meet that goal now, or in the near future? If you're far from your goal, what are the steps you will take toward meeting the goal? Is this goal financially viable without cutting some of your current expenses? It is not important that you have perfect answers for every question that arises. Life, like money, is fluid, ever changing and mercurial. Your expectations of one another will surely shift over time, your goals as well; the importance lies in having confidence that your relationship is strong enough to handle immensely personal inquires such as these. You are, after all, about to become one another's lifetime teammate. I look forward to receiving more questions in the week ahead. As per usual, please send them to "ASK NOAH" at nskass@gmail.com.